C.W. Eavestroughing strongly believes in a safe work place. In addition to comprehensive work site insurance, C.W. 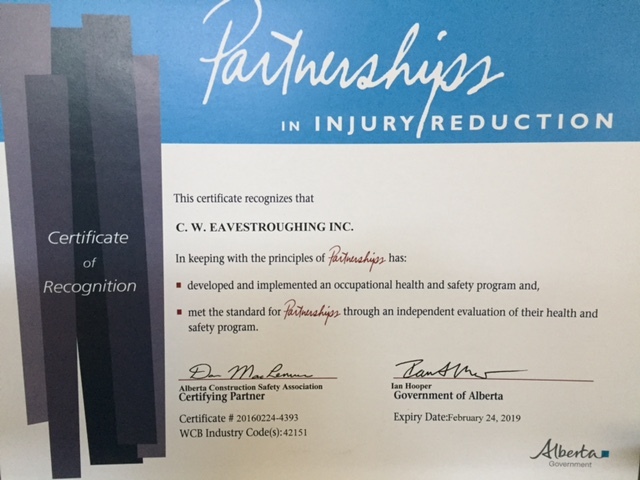 Eavestroughing has a Workers' Compensation Board account in good standing and has earned a Certificate of Recognition from the W.C.B. This Certificate assures the builder or home owner that all work is performed by qualified and trained installers in full compliance with current Occupational Health and Safety standards. 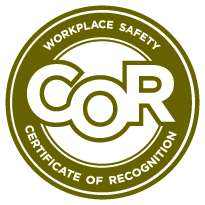 By choosing to hire a contractor who has attained this accreditation you have not only significantly reduced the potential for accidents or injuries on your work site, you have also reduced your exposure to the liability that results from these accidents.